> Blog >	Leovince One Evo, features and review. And not had any problems. I do not put more noticeable because one order I can not evaluate fully. With over thirty years on the market, Leovince is a pioneer brand of exhaust pipes. It offers a wide range of products suitable for different types of motorcycles (Scooter, Road, Adventure, etc.) and automobile brands. LV-10, Classic Racer, GP Duals, LV Pro Carbon, Factory S Carbon, LV One Evo Carbon, Nero, GP Style, GP Corsa Evo, X3, Granturismo Black Edition, Touring, LV 10 Black Edition, GP One and X -Fight are some of the most popular Leovince exhaust models, among many others, found in the LV One EVO Inox, LV One EVO Carbon, Factory S Inox, Factory S Carbon, GP Corsa, GP Corsa EVO, GP Style families. , Nero, Underbody, X3, Granturismo, X-Fight, Hand-Made TT and Touring. The Leovince LV ONE EVO exhaust gives you two versions, which harmoniously combine the tradition and modernity of the Italian brand. The one made of carbon fiber and the one available in stainless steel. The Leovince LV ONE EVO Carbon presents a matte finish in the high resistance carbon fiber coating. The outlet cup and clamp are also made of the same material and have that matte finish, which gives a compact image to the tube. 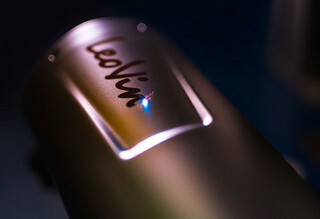 The logo of the brand is included, as a silver aluminum adhesive plate, which stands out against the black background of the Leovince exhaust. This exhaust is available for the brands BMW, Ducati, Honda, Kawasaki, KTM, Suzuki, Yamaha y la británica Triumph. This silencer is characterized by its lightness, which guarantees the optimization of performance. Its 100% carbon design allows it to withstand up to 900º C and makes this exhaust one of the most resistant to high temperatures. In this case, the coating is made of AISI 304 stainless steel, which provides a less discreet design in silver tone and with a Look Titanium finish, which combines with the carbon fiber outlet cup and matt black finish. The clamp is also made of carbon fiber. The logo is laser engraved and stands out on the silver surface of the coating. This Leovince LV One model is available for Aprilia, Benelli, BMW, Ducati, Gilera, Honda, Husqvarna, Kawasaki, KTM, MBK, Peugeot, Piaggio, Suzuki, Sym, Triumph, Vespa and Yamaha.. The casing of its stainless steel casing gives it great lightness and shock resistance and its carbon outlet cup, in an ovoid shape, allows it to withstand up to 900º C. It is, therefore, one of the models with more features than the brand. The explosive sound it emits is another of its characteristics. The brand has been consolidated, it distributes its products all over the world and there are already many MotoGP, Superbike, Motocross or Enduro teams that rely on it. In our store you can buy the Leovince Evo and many more Leovince escapes in our leovince promotion.